Janet Casapulla, owner of GreenBarn Covers and Curtains, has worked in the home furnishing industry for the past 15 years. She learned to sew at a very young age, and was making her own clothes by the time she was a teen. Her meticulous attention to detail and skill with a needle has brought her many repeat customers in the central Massachusetts area. Janet is a graduate from Custom Home Furnishings Academy as a Career Professional in Slipcovers and a member of the Window Coverings Association of America. We make the process for ordering a slipcover or curtain as simple as possible for you. A GreenBarn representative visits your home or office to discuss your slipcover needs and pick up the furniture you wish to cover. 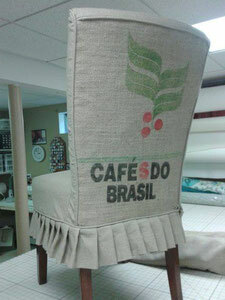 Your slipcover is created for you and finished according to the pre-arranged schedule. Your slipcovered furniture is delivered back to your home or office. A GreenBarn representative visits your home or office to measure your windows and discuss your custom curtain needs. Your curtains are created for you and finished according to the pre-arranged schedule. Your curtains are delivered and installed.